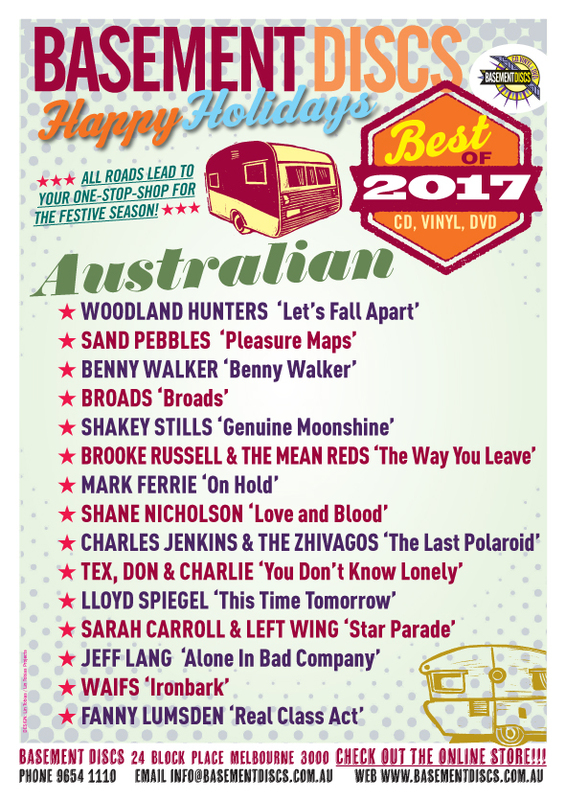 Top 10 album release of 2017 PBS FM; Best of 2017 Australian album releases Basement Discs. "This album has wrecked me. It has rendered me incapable of forming the right words, of stringing together the right sentences, to properly convey its mesmerizing beauty. In my head this review has been started and aborted at least once for every, singular minute that Day and Hendry weave their musical web. I am ensnared almost to the point of incapacity and the harder I fight, the further I fall. There are moments on this album when I’m literally stopped in my tracks. When Day and Hendry hit the chorus of “Kerosene Dream,” for example, I melt. The pen falls from my hand, my eyes close, and all I can do is listen. Listen like a sailor being led to the rocks by two sirens and I’m absolutely at peace with my own demise in those lucid moments." Boogie: Music Festival or Cult? "Onstage, the star performers were Broads, a seductive duo of virtuistic, harmonised simplicity: 2 women, 2 guitars, 2 voices and the sublime result, a pair of soaring angels descending down to us from the heavens awakening our party weary spirits." There are pious people of various faiths all over this world of ours that believe the proof of the existence of a higher power rests in you only opening your eyes. The creation of all things beautiful is enough for them to justify their beliefs. The sun rising gently in the East and setting gracefully in the West, soft rain falling on a Summer’s eve, the fiery hues of an exploding Autumn, when your eyes lock with the one who has stolen your heart, it’s all there for those who believe that there is something bigger than us. For even the most skeptical there are occasionally moments in life that have us at least questioning the serendipity of it all. Roughly 15 hours and 16,000 miles away from this keyboard there are two voices that found one another years ago and now create music alluring and touching enough to give credence to those who feel that the magnificent things in life happen for a reason. Kelly Day and Jane Hendry are one half of Melbourne, Australia’s The Nymphs. The virtues of Australia’s greatest gift to a cappella music, vocal harmonies, and retro aesthetics have been extolled upon the regular readers of this site on more than one occasion. When one of The Nymphs moved out of the country the future of a group of rising stars was left in serious doubt and a self-imposed hiatus ensued. Day and Hendry though have carried on as a dynamic duo under the moniker Broads (a tip of the cap to their former outfit no doubt) and have once again graced us with their heavenly voices in the form of their debut, self-titled EP. The immediately noticeable difference between the two outfits is the instrumentation. The Nymphs had virtually none, sans for four voices melting together into sonic gold. While the instrumentation on the Broads debut EP is as sparse as can be, the unmistakeable accompaniment of acoustic guitars gives this effort an entirely different vibe than what Day and Hendry were producing with their Nymph cohorts. It’s as if these two ladies have found yet another rabbit hole in the space-time continuum and firmly planted themselves amidst the earliest folk singers of the 20th Century long enough to pick their brains before hoping into a smokey bar somewhere amidst the rebuilding decade following World War II. Hendry, and especially Day, who pens three of the five tracks here, remain masters of the “negative space” where sometimes what isn’t being said or what isn’t being played is just as important to the structure of the material as anything else. The main fixture though is their voices, forever intertwining in lush harmonies that are downright Earth-shattering at certain points. Theirs is the ability to make the sun shine even in the darkest of moments with just a handful of notes shared between them. Hendry’s “A Killing” is a stellar, yet unconventional, love song that doesn’t just tug on the heart strings, so much as it rips them right out. Meanwhile Day’s “The World May Be Over” equals her partner in intensity, a potent mix of love and longing that is intensified by dreamlike vocals floating along a somber guitar line. The entire EP is a magnificent display of songwriting and the Day/Hendry connection is electric in their ability to filter raw emotion through graceful and elegant simplicity. You’ll be hard-pressed to hear anything more beautiful in the near future.